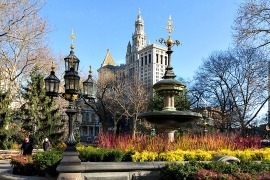 One of the fastest growing neighborhoods for families in NYC, the Financial District offers a plethora of housing in sleek new buildings and converted office buildings, excellent elementary schools, off-the-beaten-track museums and the 25-acre Battery Park. The one thing FiDi doesn't have? Businesses that cater to children, so you still have to go to nearby Tribeca or Battery Park City for most of the kid-friendly venues. But for visiting families, FiDi has lots of cool spots to explore that give you a peek at NYC's history. Every NYC kid should see where our first President was inaugurated, went to church and disbanded his troops, and realize that once upon a time the city ended at Wall Street. And of course, the South Street Seaport is always fun, and hosts FREE kids' entertainment and is home to the one-of-a-kind Imagination Playground. Our guide to the Financial District has the scoop on the best places to eat, play and experience with kids. We hope you enjoy getting to know the neighborhood with your family.